Qui-Gon believed Anikan was the chosen one. When Qui-Gon died, Obi-Wan took over Anikan’s training as a Jedi, believing as his master Qui-Gon did, that Anikan was the great hope. Yoda was never quite certain. He always had questions about Anikan. He sensed the boy’s confusion, his fear, his clinging to desire, his ego. Throughout the first two and a half episodes of Star Wars that was the question, unless of course, you like most had seen the original series first. Then it was a foregone conclusion. You didn’t have to wonder if Anikan was the chosen one, the one who would bring balance to the force and save the world from endless war. You already knew that he wasn’t, that he would succumb to his fears and desires, and be swallowed by the dark side. I paid close attention as Anikan transformed from the spunky little boy into the young man filled with fears. He was so vulnerable, his emotions intense, his obedience undisciplined. I felt him struggle to be good and identified with his despair at being unable to save those he loved. I identified with his pain at failing. 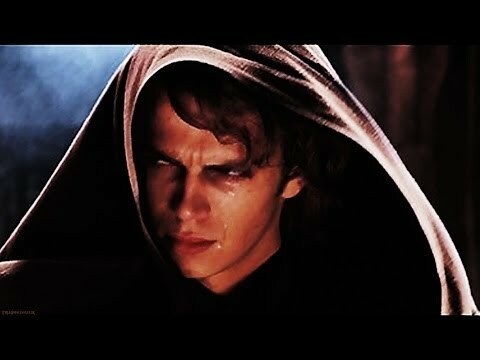 Watching Anikan turn into Darth Vader, the super villain of our times, was agonizing. I’ve watched the series before. Heck, I own it. I’m a true fan, but this time was different. Watching, I realized that I had missed the not so hidden story. I finally grasped that the story of Anikan Skywalker wasn’t a story of failure and darkness, it was actually a love story of epic proportions. This time I allowed myself to trust the flow, to trust the unfolding storyline, to let the possibility exist that nothing was ever wrong. In doing so, I felt the great love Anikan had for his mother. I empathized with his rage when she was kidnapped and brutalized. I felt his unreasonable yet real fear of losing his wife in childbirth. I understood his need to do something, anything to protect her. His love, his heart was huge. It was his love that motivated him, that moved him into the unthinkable path. How far down the dark path do we need to go, before the return path seems to close behind us? As I watched, I remembered. Throughout Kenny’s cancer, I had a recurring dream. I was a child, not very old, perhaps ten or eleven. I went to sleep in my bed but woke up in a brightly lit school corridor night after night. Each night it was the same. I was chasing several beings of light down the slick floored passageway. They were always too far ahead. I couldn’t run fast enough. I would yell at them to wait for me but they didn’t hear me. I knew if I could catch up to them, I would be able to save Kenny. I never did. As I watched Anikan, I wondered. Had someone arisen from the dark and offered me the power to save Ken, would have I accepted? Perhaps not at first, perhaps not even as the years passed, but in those final weeks and days, what would I have done? I don’t know. I can’t know. It didn’t happen. It wasn’t the love story I was here to experience. Mine was mine. Anikan’s was his. Allowing myself to feel into the question, opened my heart in compassion for Anikan, for all the Anikans of our world, all those people trying to save the ones they love, trying to be good, or simply to survive in this world of contradictions and paradox. Anikan Skywalker’s story was a true love story, and in the end, love won. Luke, the agreed upon hero of Star Wars, would not give up on his father. He sensed there was still light within him. He was willing to lay down his own life rather than see only darkness when he knew light existed. When the Emperor realized he could not convert Luke to the dark side, he attempted to terminate him. Anikan, still bearing the mask of Darth Vader and dying of his wounds, saved him, saved the world and brought balance back to the force. He could only do that because someone, Luke, hadn’t given up on him, had seen light where others only saw darkness. Anikan was the chosen one. 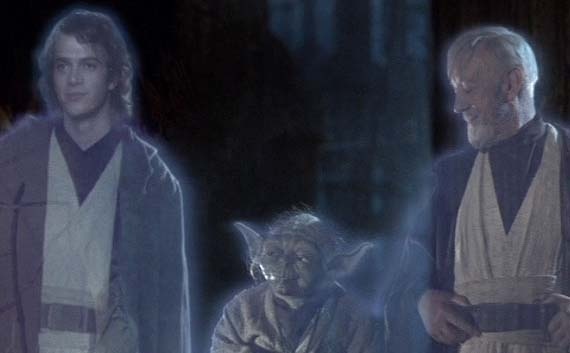 Obi Wan and Yoda missed the truth of the prophecy. They didn’t understand that Anikan had first to enter into the depths of hell before he could emerge the hero—not too different from those of us who walk upon the Jedi’s path. Each of us is chosen. Don’t be dissuaded by appearances. The light shines. It is everywhere, in everyone. It is never as dark as your mind would have you believe. The trick, the Jedi trick, is to step beyond beliefs into the reality of the Force. This entry was posted in Awakening, Brutality, Cancer, enlightenment, Healing, illusion, judgment, remembrance, Wonder and tagged Anikan Skywalker, Darkness, light, Luke Skywalker, Obi-Wan, Qui-Gon, Star Wars. Darth Vader, the chosen one, The Force, Yoda. Bookmark the permalink.